March is the perfect time to visit Las Vegas. The temperatures start rising during the day and it's often sunny s,o before you know it the pools are dotted with people who have been dying to put on a swimsuit. You'll see plenty of visitors in town for the huge March Madness parties as the NCAA Basketball tournament will dominate the televisions at most of the casual bars and restaurants. There also tends to be lower room rates and more deals during the springtime. The sun feels warm but the air is still crisp in March so, in essence, it is the perfect time to work on your tan but not your breaststroke. Skies are typically sunny, with only 0.43 inches of precipitation in an average March, and Las Vegas has low humidity this time of year. March in Las Vegas is perfect for daytime walks under the bright sunshine but be aware that it does get cool during the evenings. You will need to pack a few light layers, such as sweaters, windbreakers, and jeans or long pants for when the sun goes down. Otherwise, during the day, you should be comfortable in T-shirts and maybe a maxi-dress for women. Pack a swimsuit for the resort hot tub or pool, if you don't mind a bit of a chill. And if you're planning on going out to the clubs, you'll want to pack snazzy outfits, like heels and fancy dresses for the women and a nice button-down and slacks for men. 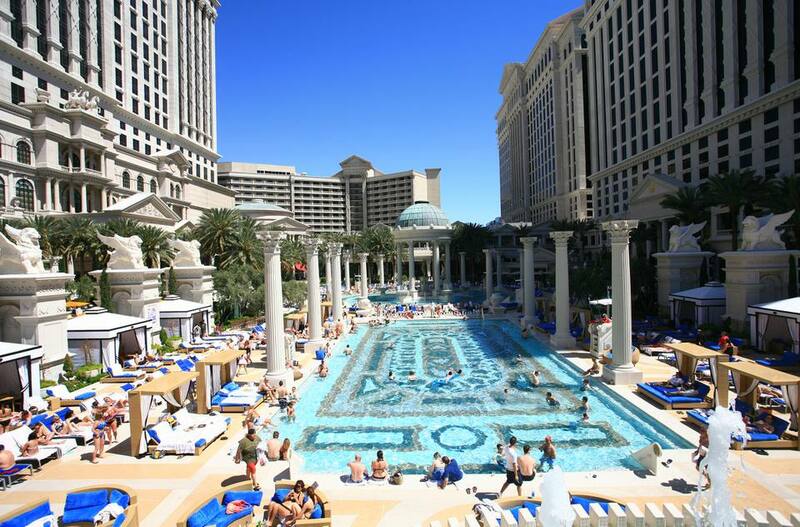 Even the cooler spring in Las Vegas offers plenty to do, with vacationers spending their spring break in one of the top tourist destinations in the world. March Madness: The NCAA basketball tournament fires up the strip's casinos, resorts, clubs, and sports bars with fans cheering for their favored college basketball teams. Although none of the games themselves take place in Vegas, it's a great time to gamble at one of Las Vegas' sportsbooks. Spring Break: March is prime time, so expect to see many college kids packing the pool areas. You'll want to book rooms in advance during these days. St. Patrick's Day: Along with the parade and festival, a number of great resorts and casinos offer holiday revelry along the Las Vegas Strip. Stop by Rí Rá Irish Pub in the Mandalay Bay Resort for authentic Irish music and dancing on March 17. Nevada Women's Film Festival: Held on one of the last two weekends of March, this film fest offers moviegoers a chance to see award-winning films. Spring is all about the bright sunshine and the crisp air on the Las Vegas strip. Go ahead, put in about three miles up and down the strip and then have a fabulous lunch at a spot like Spago, Enoteca Otto, or Mon Ami Gabi, or anywhere you can people watch and have a few drinks. Dinner on the patio at LAGO Las Vegas or beside the water at Costa Di Mare at Bellagio is perfect this time of the year. Do you feel it in the air? That is pool season about to begin and March is the time when the pools start dusting off the lounge chairs and folks start hitting the gym in order to shed some clothing. Late March is when the pools start opening and the temps are a little better for pool sitting, so you might need a little more alcohol by the pool earlier in the month just to keep you warm when the winds pick up. Work on your color because by the end of the month pool season will be at full throttle. To learn more about if you want to visit Las Vegas in the spring, check out our guide on the best time to visit.